Okay, so let’s be honest here. This whole Meatless Week thing? Well, it hasn’t exactly been a challenge for me. This is the way I’ve been eating for months now. I bring it up here because I think it’s a valuable undertaking and I sincerely hope that some of you have been trying it out for yourselves–or if not this week, pick your own! Going meatless is a learning experience, whether you find it difficult or think that it’s easy, breezy, amazing. But again, it’s not like I’m really taking on anything and I feel a little like I’ve been sitting over here twiddling my thumbs and whistling away my meatless days. So I wanted to step in and offer up a recipe. We’re more than halfway through here, so there’s a chance that some of you may be running out of ideas, and I especially want those of you who are struggling through to stay strong. 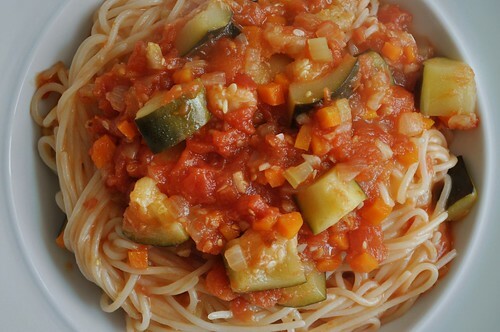 So here it is: Spaghetti with a Spicy Zucchini Sauce. Pasta is an easy and simple starting point for meatless eating–even for us gluten-freers with all the great GF options out there these days. It’s quick, it’s filling, and it’s incredibly versatile. And if you’re not yet a fan of veggies, I ask you, What doesn’t taste good when you toss it in a pile of spaghetti? The correct answer is: Nothing. That having been said, this sauce is tasty enough to stand on it’s own. It’s light and fresh with just a little kick from the crushed red pepper, though feel free to make it a full-on roundhouse if you really like the heat. I served it with pasta, but, considering the leftovers the next day, realized that it would be just as good on top of rice or quinoa. 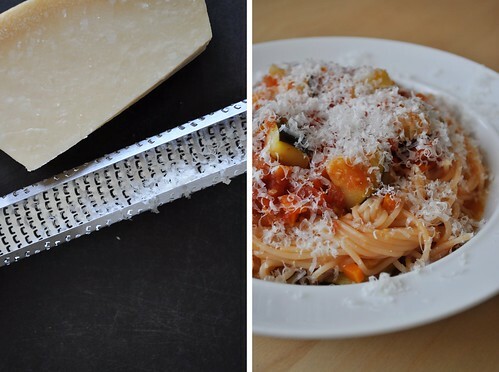 And if you’re anything like me, a little Parmigiano Reggiano grated over the top is always welcome. Bring a large pot of water to a boil. Salt the water generously and cook the spaghetti until al dente. Heat a tablespoon of EVOO in a medium pot over medium heat. Add the onions and saute until translucent. Add the carrots and celery, cooking until the vegetables are tender, about 5 minutes. Add in the garlic, crushed red pepper, and zucchini. 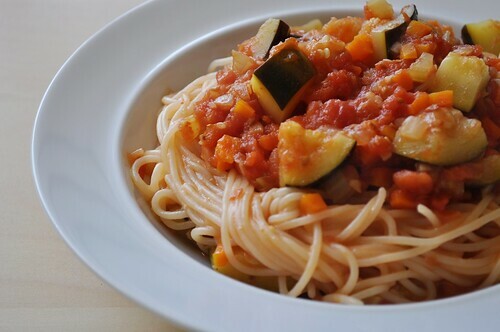 Cook for 5-10 minutes, or until the zucchini is just starting to become tender. Season with a pinch of salt & a few grinds of black pepper. Next, crush the tomatoes in by hand, adding their juices and discarding any skins or hard stem ends. Allow the sauce to simmer for at least 20 minutes, longer if you prefer softer zucchini. Adjust salt & pepper to taste. Once the sauce is done to your liking, toss half of it with the cooked pasta. Top individual portions with the remaining sauce and serve. Mmm…this makes me hungry! Beautiful pics! your absolutely right about the pasta, pretty much anything you cover it with is wonderful…especially with some freshly grated cheese!